The original Navajo code talkers created a code using English and Navajo, which was used for communication during the war. Their code was never broken. After the end of World War II, a group of 29 Navajo men kept a major secret about their time in the United States Marine Corps. And they kept that secret for more than two decades. They were the original Navajo code talkers, who created a code using English and Navajo, which was used for communication during the war. Their code was never broken. Chester Nez was one of the original code talkers. He was in his late 80s, when he co-wrote the book, Code Talker: The First and Only Memoir by One of the Original Navajo Code Talkers of WWII. "Chester volunteered as a marine for a secret mission. He was chosen from among 200 to 300 young Navajo men," said Judith Avila, who co-authored the book. Latham Nez and Judith Avila pose with photographs of Chester Nez in their home in Tijeras, New Mexico. Latham is Chester's grandson, and Avila co-wrote the memoir, Code Talker. 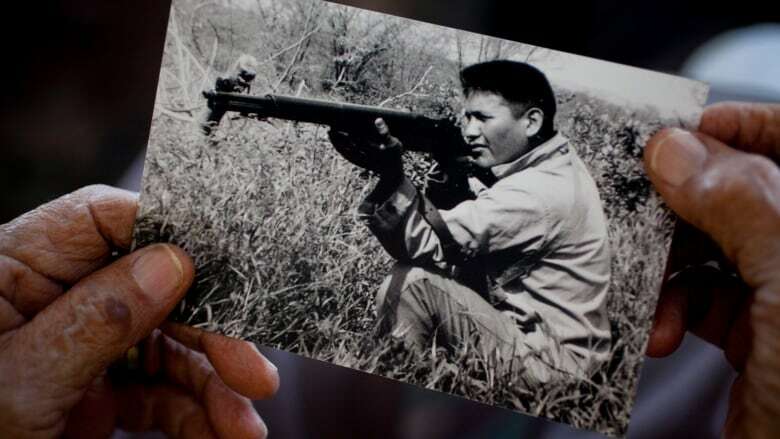 (Stephanie Cram/CBC)"He didn't know at the time what his secret mission would be, but it turned out that the mission was to create a code that would be unbreakable, utilizing both English and Navajo." The book was a labour of love for Avila, who spent hours with Nez remembering details of his time as a code talker. "He remembered so many things in great, great detail. He told me about sitting there in a classroom, with bars on the windows and a safe where they locked all their working materials when they were designing the code," said Avila. "He talked about what they were thinking when they came up with the different code words, and then he talked about being sent to Guadalcanal, where they proved the code worked in battle." Avila explained that the code would only be decipherable for someone who speaks Navajo. "When they designed the alphabet, they chose an English word for each of the letters of the alphabet, so A was ant, B was bear, and C was cat. But then they translated each English word into Navajo." Beyond creating an alphabet using Navajo translations of English words, the code also included terms for military equipment. "My favourite was fighter plane, which was hummingbird in Navajo, and I thought that was so appropriate because hummingbirds are so tiny and maneuverable but mean; if you've ever had a hummingbird feeder, they'll dive-bomb each other." 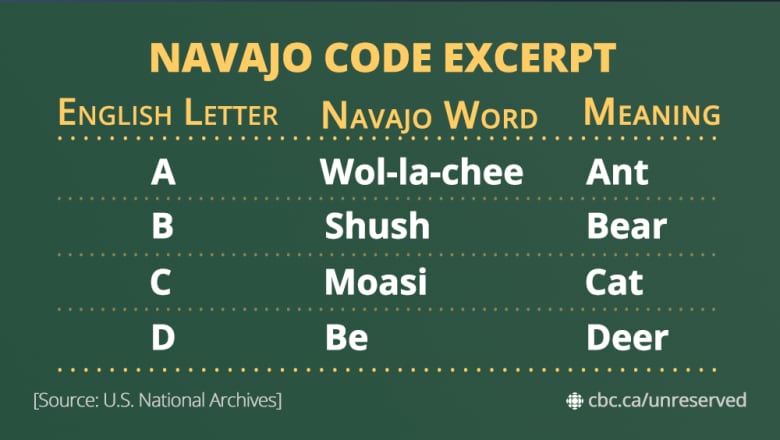 Over the years, there were a range of codes written in mostly Native American languages, but the Navajo code was the only one not broken, Avila said. Navajo code talkers used a combination of English and Navajo to create an unbreakable code for the Unites States war effort in WW II. Latham Nez said that growing up he wasn't told too much about his grandfather's time in the war, but recalled that the war haunted Chester Nez. "He had nightmares. Growing up as a kid I remembered him ... in the middle of the night, just shooting up into the air," said Nez. In high school, Nez learned about what his grandfather's generation had to endure, which included having to attend residential school, where Nez said his grandfather was beaten and his mouth was washed out with soap. "That really angered me as a teenager, so I asked my grandfather, 'Why did you volunteer and fight for a country that did that to you?'" "And he just simply said he didn't want it to happen again. If communism had taken over, what he experienced, everyone would have to experience also," Lathan Nez explained. Avila recalled that it was hard for Nez to keep his secret of being a code talker, and said all he wanted was for his family to be proud of him. "Chester so much wanted to tell his dad, and have his dad be proud of him, but he said to me, 'No, I gave my word so I didn't tell him,'" said Avila. Because the code talkers were unable to share their successes in the marines, many of them had a hard time adjusting to life after the war. "All the young Navajos … figured they'd come home to the United States and just kind of slip right into society, get jobs, have a successful life, because they did so well as marines," said Avila. "Many of them died within a couple of years of the war, from hunger, from alcohol, and from depression." Upon returning home, Chester Nez was one of the lucky code talkers — he landed a job at the Veterans Affairs office in Albuquerque, New Mexico. It was believed that the United States kept the code a secret long after the war, in case they needed to use it again. But in 1968, when warfare changed and communication turned digital, the United States recognized the efforts of the Navajo code talkers, and Nez was able to tell his father about what he accomplished. 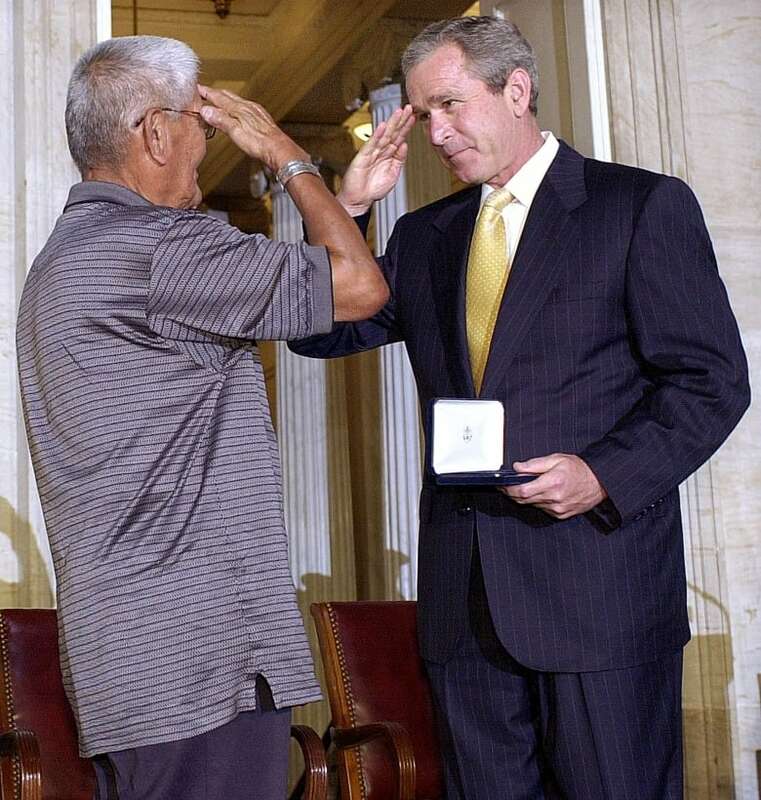 In 2001, the remaining code talkers received Congressional Gold Medals, the highest honour a civilian can receive in the United States. Chester Nez died on June 4, 2014 — but Avila and Latham Nez continue to share his story. Both Avila and Latham Nez said the book changed their lives. "I kept going through in my mind, how can … I make it so both historians and people who want to know about Navajo culture are pulled in," said Avila. "The thing I worried about the most was … I wanted to be sure that people who read the book would love him as much as I did." "He was irresistible, he was a wonderful man … and I got to tell his story." For Latham Nez, sitting in on the writing sessions helped him overcome some of his own demons. "At the time I was trying to find myself, I was a recovering alcoholic … being an alcoholic, you definitely lose your sense of being, and you just become a shell of a person," said Nez. "He definitely recentred me … I was very lucky, because [my grandfather] needed me as much as I needed him at that time, and I was very blessed for that." In addition to coming together to tell his grandfather's story, Latham Nez and Avila also found each other — they are now happily dating, living in Tijeras, New Mexico. Click the Listen button above to hear the full documentary.